Missing Dresden? Body twitching and hands trembling as you contemplate the months you need to wait for your next Butcher fix? 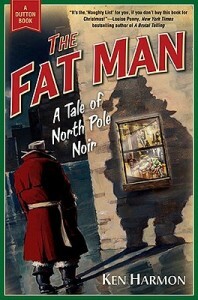 Try Ken Harmon’s The Fat Man, A tale of North Pole Noir. Gumdrop Coal, the elf in charge of Santa’s Coal Patrol, has just been fired. As the flap says: “North Pole disillusionment is nothing new: Some elves brood with a bottle of nog, trying to forget their own ‘wish list.’ Some get better. Some get bitter. Gumdrop Coal wants revenge.” Or, rather, what he wants is Justice. But we were both wrong. Sooooooo wrong. By the second time, Santa was talking about how he did what he did for children to honor the bigger present another Child gave us, I was utterly hooked. I’ve always loved Santa and I’ve always felt he represented something more than greed. This book really brings that out. This is a real Christmas book. But I should warn you, this is a Christmas book. If Christmas is not your thing, this won’t be either.